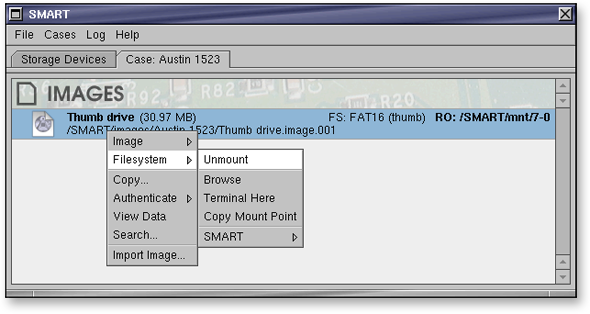 SMART gives you an easy interface to linux mounts, and GUI environments like KDE and GNOME. SMART allows you to safely preview data of nearly any type. SMART allows you to mount devices, partitions, and images. Safe read-only mounting, even for journaled filesystems. At this time, SMART is the ONLY tool of its kind that provides this added layer of non-invasive operation for journaled filesystems. You can easily mount filesystems contained in images of physical disks, even if that image is segmented. SMART provides additional functionality to some of the most common supported filesystems. Filesystem Study lets you undelete files while preserving their attributes and paths, map raw data and search hits back to filesystem objects, collect statistics info, and much more! Filesystem study enables you to aggregate unallocated space and different classes of slack space at your option. You can locate items in active and deleted files, slack space and unallocated space. 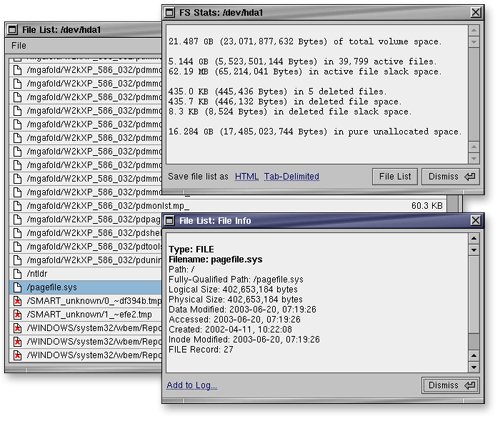 Filesystem study maps every byte to one of these classes of data.